One of Russia’s largest airlines, Transaero, has recently released a pioneering specialized training video for passengers who suffer from aerophobia. On March 27th Transaero introduced a new psychological training video for passengers who suffer from aerophobia, or fear of flying. Passengers can now watch a 45-minute video course (in both Russian and English) on board the aircraft equipped with Individual Inflight Entertainment System (IFES) in the Russian airline’s fleet. The video deals with tackling aerophobia explaining the general airplane structure, what causes the turbulence and much more. The film is intended to help passengers get rid of psychological stress and is set to demonstrate why aircraft is the safest means of transportation on Earth. Elena Zhuravleva, director of Transaero’s social policy, is certain that the main goal of fighting this phobia is giving people the freedom of movement. In addition to the video course, you can also download applications for the iPhone and iPad. 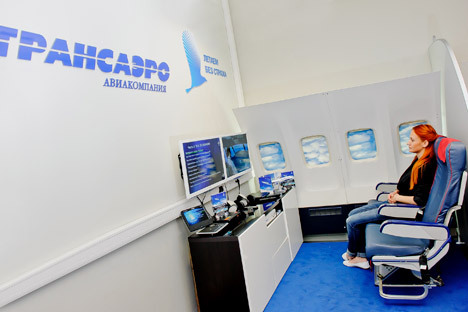 Both the video course and the apps have been designed and developed by Transaero in cooperation with the Flying without Fear Center, an organization set up specifically to treat aerophobia. Professional pilot and aviation psychologist Alexei Gervash, who is the director of the Flying without Fear Center, believes that aviation provides the highest level of safety, higher than any other industry. With the help of his colleagues, he has managed to change attitudes to flying among many of those suffering from aerophobia: about 2,000 people attend his full-time courses annually,with a success rate of 97 cures out of 100 cases. In total, thanks to Transaero Airlines and the Flying without Fear Center, more than 6,000 people have overcome their fear by participating in full-time internal or external courses. There are no precedents for the initiative in international practice. Some major airlines have organized special psychological centers that help people cope with aerophobia, but all of these courses are held on the ground and cost serious money. The main difference of the Transaero course is that it is free and helps a person while they are in a stressful situation – during the flight. Gervash believes that the video and apps will secure the success of these two companies in fighting aerophobia by raising awareness even further. Fear of flying is one of the most common phobias in the world. Thirty percent of travelers say flying is a real challenge for them, while others still are likely to panic during a flight.